The holiday travel season is upon us! This means we’re all once again digging through our hall closets and garage storage to find our favorite carry-on bags… well, not all of us! Some of the most practical specialty closets I’ve been commissioned to design over the years are for stowing away luxury luggage! 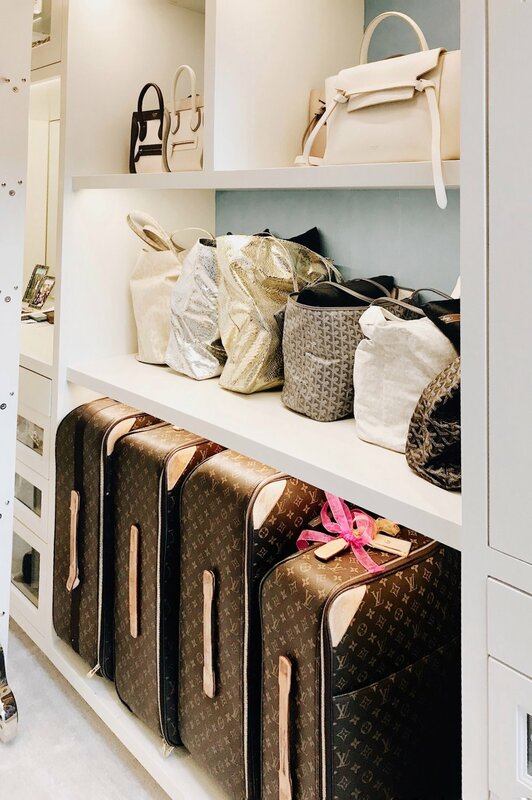 If you thought it was important to have a place to protect your shoes and handbags, you’ll understand why clients are starting to dedicate space for their suitcases. Traveling for the holidays can be stressful enough; the last thing you want to do when packing for a trip is spend precious time trying uncover a suitcase in a cluttered storage area. And, contrary to what you might think, finding functional ways to store them doesn’t have to require a ton of space. 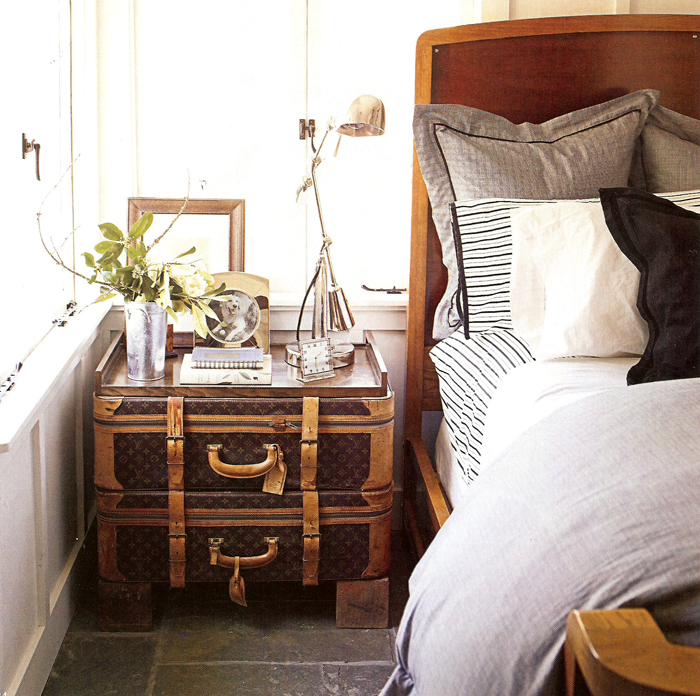 If you can get creative, and dedicate an area the appropriate size for your suitcases, it can make packing a breeze! 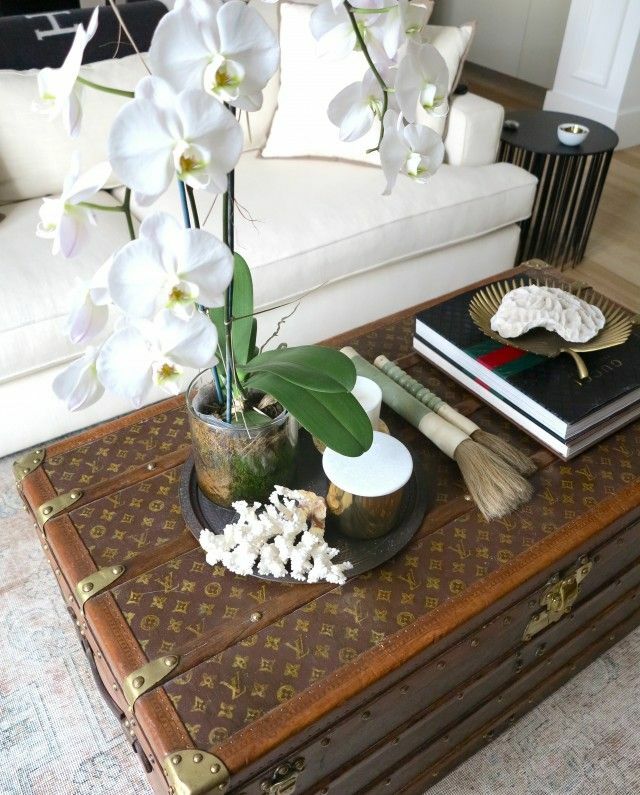 What we often forget when trying to store luggage - these trunks and travel bags are MEANT to store things! Therefore, they don’t have to take up extra, unnecessary space. 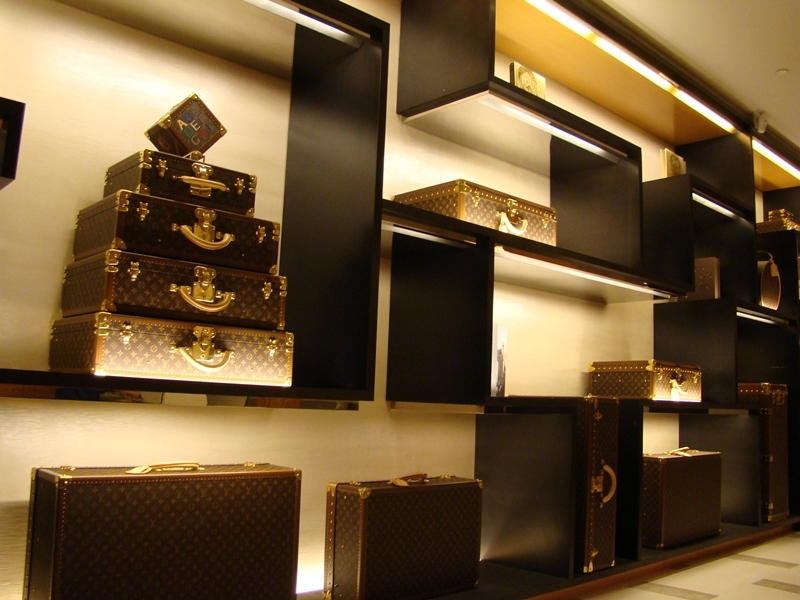 If your closet is already bursting at the seams, consider incorporating your luggage as decor in the space. If you have nice travel accessories, they can be used to keep seasonal items out of sight, and become the focal point of your closet (or any room in the house)! Often, clients just aren’t making the best use of their existing space! They hesitate to store anything on the top shelf of their closets, for fear of not being able to reach. The same can be said for the space under your hanging clothing - you’re afraid if you store anything here, you’ll forget about it and it will be lost forever! These are both real concerns, but luggage is the exception! Take back that underutilized space by tucking your travel bags away, out of sight, but still within reach. Next time you’re packing, you’ll have everything you need right there in your closet. 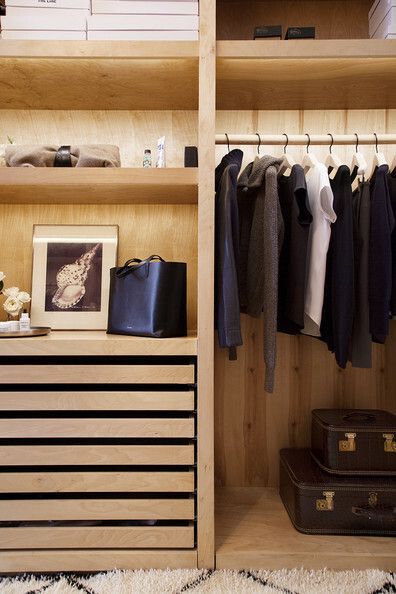 Clients often forget that nothing about their closet is set in stone! It might require a few touch-ups, but adding/removing shelves and rods are simple solutions that can exponentially improve the functionality of the space. This is a room where you’re usually starting and ending every day, and it’s worth a little investment to make that experience run smoothly! 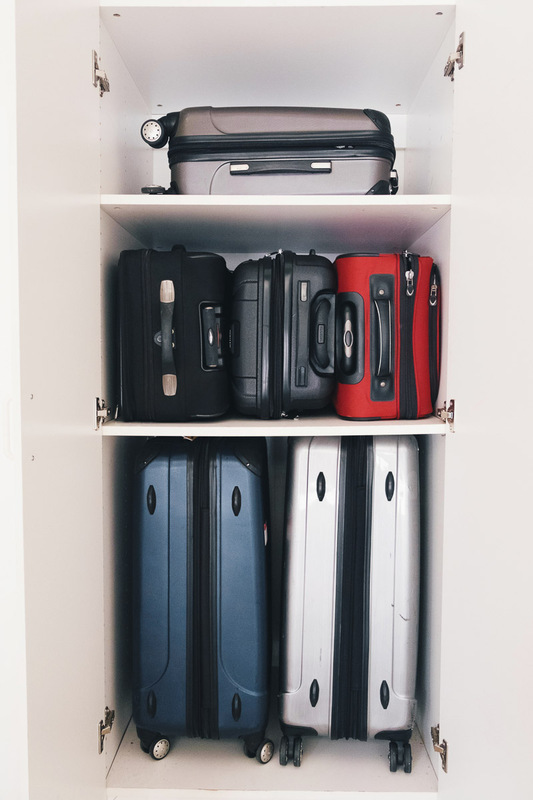 If you’re storing large suitcases in a basement or separate area of the house, I would recommend a little reorganization, removing a couple of shelves, and designating a space in your closet or dressing room to keep them close! This is definitely the way to go, if you have the space to allocate! 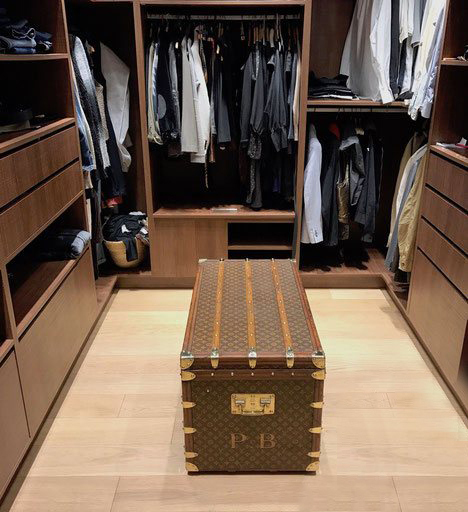 Whether it’s converting a linen or hall closet, or designating an area of your dressing room, custom suitcase closets are the perfect way to stow your luggage in style! Designed to fit everything from totes to trolley bags, these spaces can incorporate custom lighting, hooks, staging areas, and a place to pack. No more trekking to the corners of your home every time you need to pack a bag!